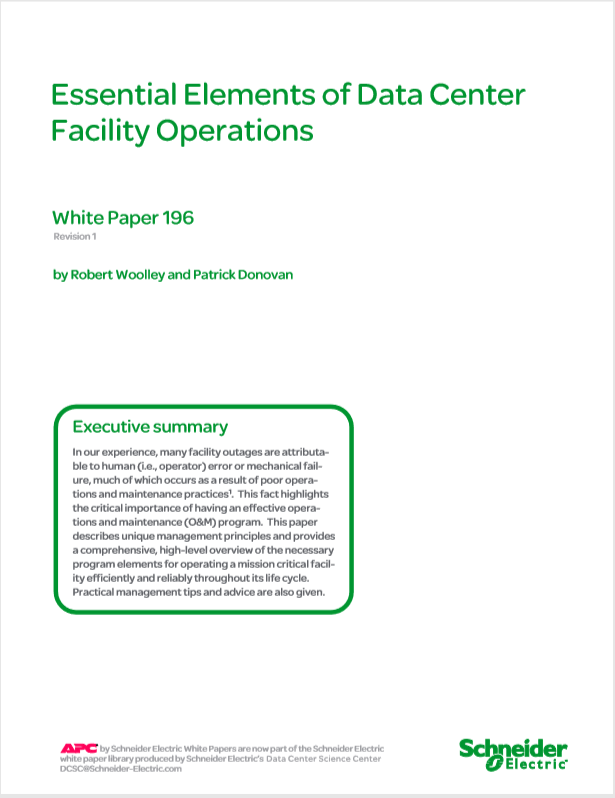 This Schneider Electric paper describes unique management principles and provides a comprehensive, high-level overview of the necessary program elements for operating a mission critical facility efficiently and reliably throughout its life cycle. In our experience, many facility outages are attributable to human (i.e., operator) error or mechanical failure, much of which occurs as a result of poor operations and maintenance practices1. This fact highlights the critical importance of having an effective operations and maintenance (O&M) program. This paper describes unique management principles and provides a comprehensive, high-level overview of the necessary program elements for operating a mission critical facility efficiently and reliably throughout its life cycle. Practical management tips and advice are also given.